Which is better, beans or dreams? Mean Bean Machine is better, man. It's got an extra mode. this game > than mean bean machine, no doubt! Sega fans buy Robotnik. Nintendo fans buy Kirby. I did wonder as to whether this game would appear on virtual console or not becauses its practically the same as the Robotnik game. Avalance/Ghost Trap is more fun though, I love the music. I've always preferred this to Mean Bean Machine. 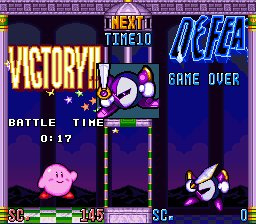 I suppose it's just becasue I'm a Kirby fan. Me and my Mum spent hours and hours on this game! If this game similar to MBM, then it's a big bummer that it doesn't support the wiimote setup. It is so silly to use classic controller or the wavebird for a game like this. Mean Bean Machine is becoming the most played vc game on my wii but without the cute and simple wii remote controller, I'd think that starting to play this would be too much a hassle. I recommend MBM to everybody unless they fix this. 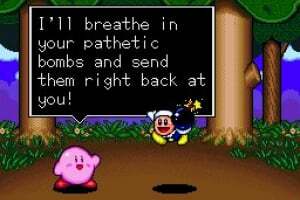 Another Kirby game?! 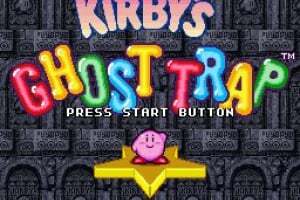 How many Kirby games are there on the SNES? Why do we need all these spin off titles first? Dreamland 3 and Fun Pak are the real ones we need on VC! 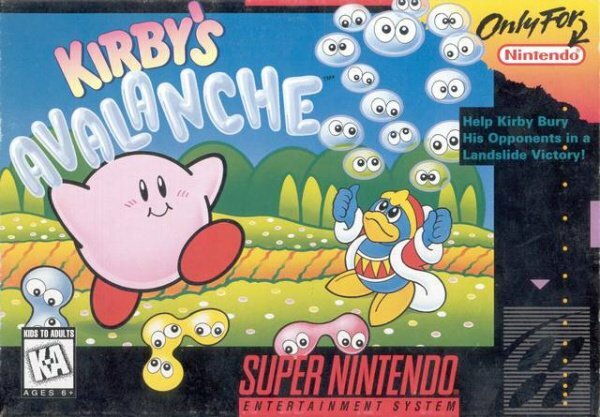 First Kirby's Dream Course, now Kirby's Avalanche. My brother is going to be so siked! Rats! We didn't get the game today! 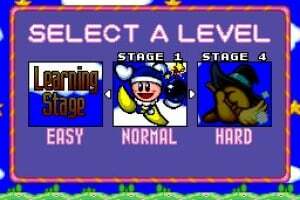 Kirby's Avalanche has better music then MBM but MBM has the big advantage of a password system and the ability to use a wii mote. The only possible reason why this game won't support the wii mote and mean bean does is because Nintendo is taking the lazy way out. The reason this doesn't support the Wiimote is because it's a Super Nintendo game, and they haven't had a reason to make an exception for a single game before -- I'll bet it's just running the game through an emulator which just assumes it'll need a classic controller so all the buttons are present. This isn't Nintendo trying to "pull a fast one" or anything by making you HAVE to buy a classic controller... and seriously, if you don't have one by now... WHY NOT? Both MBM and this game were originally outside of Japan only. They were both based on the multi-platform Puyo Puyo 2. That's why they're so alike! 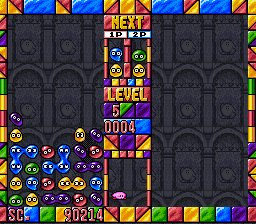 Both Kirby's Avalanche and Mean Bean are based on Puyo Puyo. 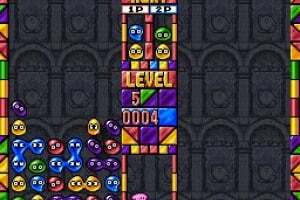 Sega published both Mean Bean Machine and the arcade game since they partially owned the rights to Puyo Puyo until Sonic Team took over in 2002. 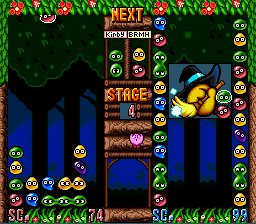 The SNES version was based on Super Puyo Puyo, hence the copyright mention of Banpresto and Compile (Puyo Puyo's original developer) with HAL Laboratory slapping on the Kirby license (much like SEGA did with the Sonic license, ironically without the blue dude). 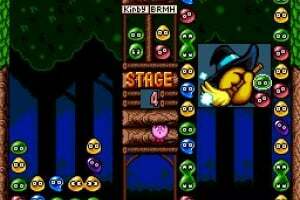 It's still a great puzzle game for both Puyo Puyo and Kirby fans alike. In my honest and impartial opinion, the Kirby version is slightly better than the Robotnick one. The music on Robotnick is kind of... outdated. And the graphics are not as good, as the game suffered from that "grainy" sindrome late Genesis/ Mega Drive games had. Not a horrible time waster. 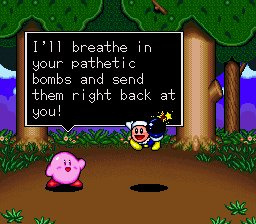 The music is great, but the entire experience is almost ruined by giving Kirby awful dialogue. It's real stupid that Nintendo didn't make an exception for this game to be compatible with the Wiimote. Well, I've already got Puyo Puyo 2 (which I am so glad I can play officially now, after years of playing on emulators), so I don't think I'll be spending $8 on this too soon. Still, three stars seems a bit harsh. The only reason I got this was because I am a fan of the series. A little fun, but it's not worth it. Maybe for $3. I like this a lot more than Mean Bean Machine. My best friend LOVES this game. This game is okay and I liked it. 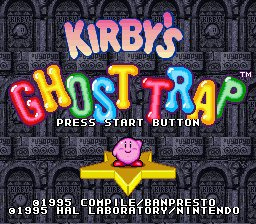 Nintendo should have a new version/remake of this game. It would be better to have a new Kirby's Avalanche game, now it should be in 3D style and all of Kirby's Bosses, the ones they were in the original game: 1. Waddle Dee 2. Bronto Burt 3. 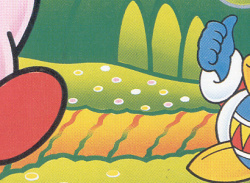 Waddle Doo 4. Poppy Bros.Sr. 5. Whispy Woods 6. Kabu 7. Broom Hatter 8. Squishy 9. Lololo & Lalala 10. Bugzzy 11. Paint Roller 12. Heavy Mole 13. Mr. Shine & Mr. Bright 14. Kracko 15. 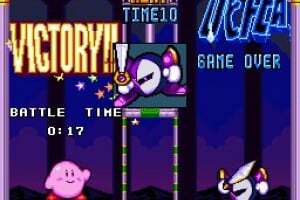 Meta Knight 16. King Dedede should return. 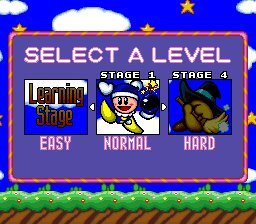 Waddle Dee, Bronto Burt, Waddle Doo, Whispy Woods, Broom Hatter, Meta Knight and King Dedede are shown in 3D. Kracko and Bugzzy had appear in Super Smash Bros. Brawl as trophies and shown in 3D and they should be in 3D game. Poppy Bros. Senior, Kabu, Squishy, Lololo & Lalala, Paint Roller, Heavy Mole, and Mr. Shine & Mr. Bright should be in 3D for the first time. It should have new bosses at least 6 like Capsule J2, Lovely, Dyna Blade, Sparky, Phan Phan and Sword Knight. Also all of the color blobs red, blue, yellow, green and purple and the boulders should be in 3D. It would be great that Nintendo should have a new version of this game!